Promising results from recent ground testing and a funding boost provided by a new NASA budget passed by Congress earlier this year helped NASA leadership decide that the 4-pound (1.8-kilogram) Mars Helicopter could be ready in time for launch with the space agency’s next rover mission in July 2020. In an interview with Spaceflight Now on Friday, Aung said nearly five years of design, development and testing convinced NASA the Mars Helicopter was ready to go to the Red Planet, and perhaps more importantly, will not pose a hazard to the Mars 2020 rover itself once it drops the drone on the Martian surface. Spaceflight Now members can read a transcript of our full interview with Mimi Aung. Become a member today and support our coverage. The Mars Helicopter will test the viability of aerial reconnaissance, scouting and scientific exploration from a flying rotorcraft. It will be the first demonstration of takeoffs and landings by a heavier-than-air vehicle in the atmosphere of another planet. 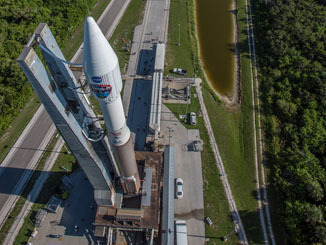 Engineers will attach the flying testbed to the belly pan of the Mars 2020 rover before liftoff atop a United Launch Alliance Atlas 5 rocket from Cape Canaveral. The helicopter will remain on the rover’s belly through the seven-month cruise to Mars, and during the spacecraft’s entry, descent and landing on the Red Planet. Early in the rover’s surface mission, controllers will send commands to deploy the rotorcraft on its four landing legs, then the rover will drive a safe distance away before the drone begins the first of up to five test flights. Officials want to minimize the risk of a collision with the rover during one of the helicopter’s test flights. Scientists also want to ensure that dust kicked up by the drone does not impinge on the rover’s instruments. “We’ve come to an agreement where everybody is comfortable at a range of 100 meters (330 feet) or so,” Aung said of the rover’s distance from the helicopter during test flights. The fuselage of the Mars Helicopter is about the size of a softball. Overall, the rotorcraft is a bit bigger than the average amateur drone on Earth. She said the size of the rotors was restricted to 1.2 meters by the space available on the Mars 2020 rover’s belly pan. In turn, the 1.2-meter rotor diameter limits the mass of the helicopter to 4 pounds — 1.8 kilograms — based on the rarefied density of the Martian atmosphere. The rotors on the Mars Helicopter will spin between 2,400 and 2,900 rpm, about 10 times faster than a helicopter flying in Earth’s atmosphere. The altitude record for a helicopter on Earth is around 40,000 feet. The concept of flying a robotic drone around Mars is not new, but Aung said such a demonstration required improvements in the miniaturization of electronics, and new, stronger, lighter structures. 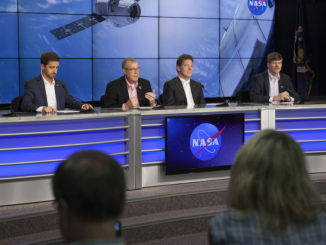 The rotorcraft’s 30-day test campaign will include up to five flights, with each hop attempting longer travel distances of up to a few hundred meters and durations of up to 90 seconds, NASA said in a press release. The helicopter’s first flight will climb to an altitude of around 10 feet, or 3 meters, where it will hover for about 30 seconds. The drone will carry two cameras, one for navigation, and another for higher-resolution color aerial imagery. Engineers also developed avionics and sensors for the helicopter to fly autonomously on Mars, without real-time inputs from ground controllers on Earth. Solar panels on the exterior of the helicopter will recharge its batteries between flights, and signals between the drone and Earth will be routed through a base station on the rover. Aung said teams at JPL are in charge of assembling the helicopter, and AeroVironment Inc., headquartered in Monrovia, California, is the contractor to construct the drone’s blades and landing year. The whole team numbers around 50 people, she said. Once the helicopter concept is demonstrated on Mars, future rovers — and potentially eventual astronaut crews — could use the technology on a more regular basis. Aerial surveillance could search for obstacles in a rover’s drive path. Not all officials were eager to see the Mars Helicopter take flight with the Mars 2020 mission. Ken Farley, the Mars 2020 project scientist at JPL, said May 3 that the helicopter could be a distraction from the rover’s top science goals. 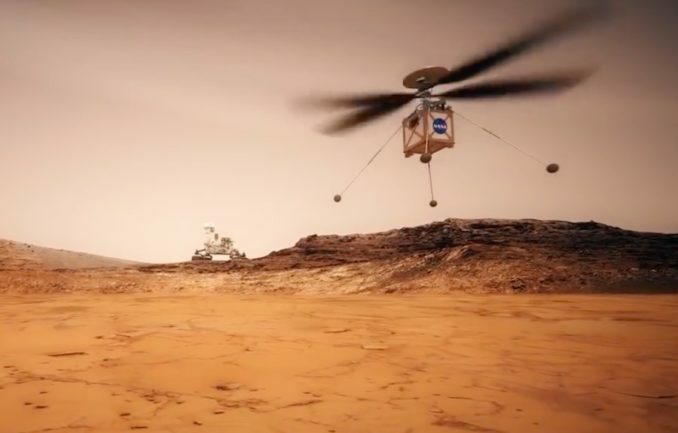 “I am not an advocate for the helicopter, and I don’t believe the Mars 2020 project has been an advocate for the helicopter,” Farley said in a meeting of the National Academies’ Space Studies Board, according to Space News. But senior NASA officials decided the Mars Helicopter demonstration was worth a try. NASA’s fiscal year 2018 budget passed by Congress and signed by President Trump in March included $23 million for the Mars Helicopter demonstration, providing the funds to begin readying the vehicle that will go to the Red Planet. 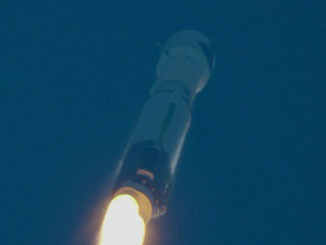 “Exploring the Red Planet with NASA’s Mars Helicopter exemplifies a successful marriage of science and technology innovation and is a unique opportunity to advance Mars exploration for the future,” said Thomas Zurbuchen, associate administrator of NASA’s science mission directorate at the agency’s headquarters in Washington. “After the Wright Brothers proved 117 years ago that powered, sustained, and controlled flight was possible here on Earth, another group of American pioneers may prove the same can be done on another world.